Louisiana! Home to endless choices for great food, great music, and Joanie on the Pony. Louisiana! 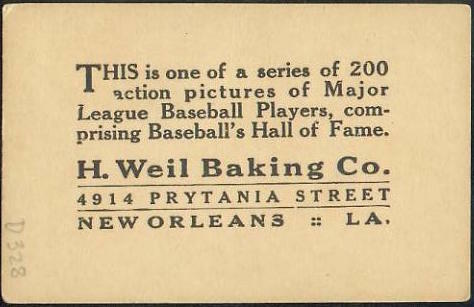 Erstwhile home to one of those food choices, Weil Baking Co., and their paeans to baseball, the 1916 D329 and 1917 D328 sets. You know them from this advertising back. 1916 D329 (1-3/8 x 3, above) is slightly smaller than 1917 D328 (2 x 3-1/4, below), which shows in the amount of white border. 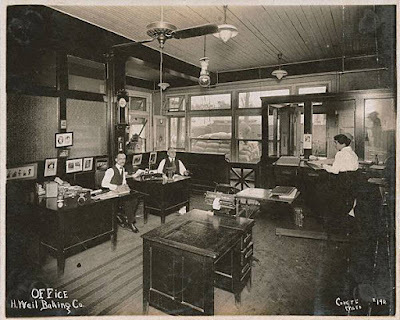 As often happens with early sets, hobby pioneers like Jefferson Burdick didn't have perfect data resources, so didn't put everything in perfect order. Based on player and team listings, we now know D329 came a year before D328. Their 200-player checklists run alphabetically and share many names in common, but changed enough year-to-year that D328 is Fred Anderson and D329 is Red Ames. Most consider D328 and D329 sets as back variations of the 200-card M101-4 and M101-5 sets, as conceived and printed for licensing to regional businesses by Felix Mendelssohn. 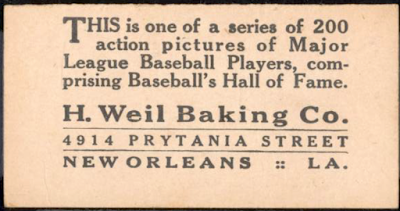 Felix's print company pitched its blank-back sets to businesses, who added ad info like "H. Weil Baking Co.," etc. 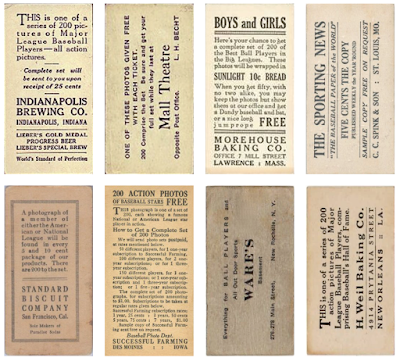 Those businesses then sold or gave away singles, lots, and sets to baseball-loving customers as incentives. 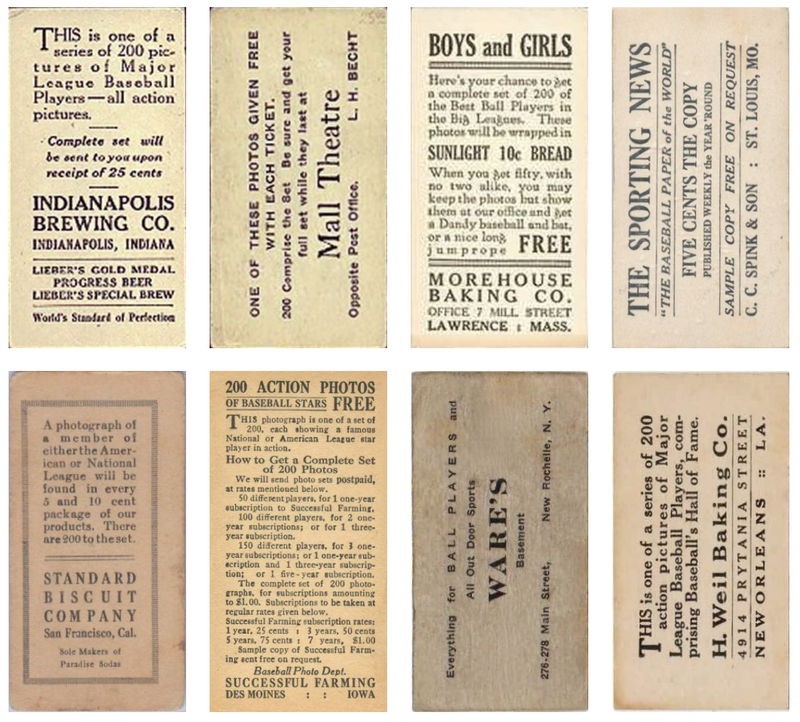 Because of the newspaper's nationwide reach and lasting appeal to baseball fans, The Sporting News is the easiest ad back to find in today's market, so collectors have also cast that umbrella name over these sets. Cards that still have blank backs are properly catalogued M101-4 or M101-5, depending on their checklist and cropping. OldBaseball.com's gallery of M101 backs shows all known examples, which vary greatly in rarity and price premium. 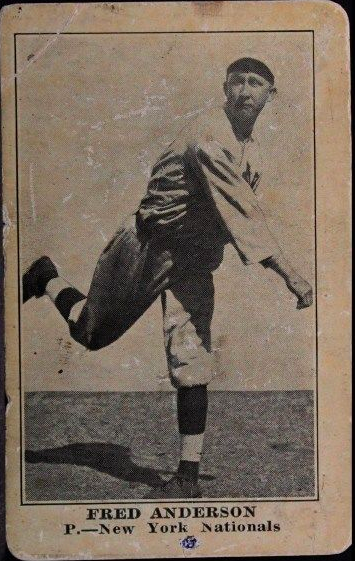 For an updated, in-depth look at M101 back scarcity, see "Details of M101-4/5 Backs" at OldBaseball's Reference Library. It's great work. Office, H. Weil Baking Co.
You can read much about H. Weil Baking Co. and see its set checklists at LouisianaCards.com, which specializes in that state's early 20th century baseball sets. Value: I've seen low-grade M101s for $10, but Weil Baking runs 2-5x times that because of back scarcity. Weil's not a truly obscure back, fortunately, so you can find an affordable type card with patience. Fakes / reprints: Many M101-based reprints exist, both as sets and for individual stars. Some eBay sellers are especially shameless about selling reprints without calling them out as reprints. Use caution and look for dealers who carry a breadth of authentic vintage material. 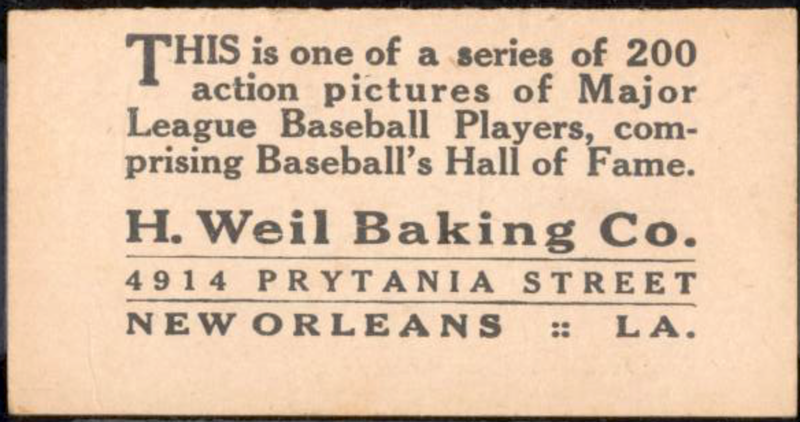 It must have been a treat back then if Mom dragged you down to Gimbels to buy clothes and you came home with a baseball card or two. Or is that not how it worked back then? My parents were vegetarian back in the day and sometimes mom got me to put with a long day of errands by promising me a piece of fried chicken at lunch. 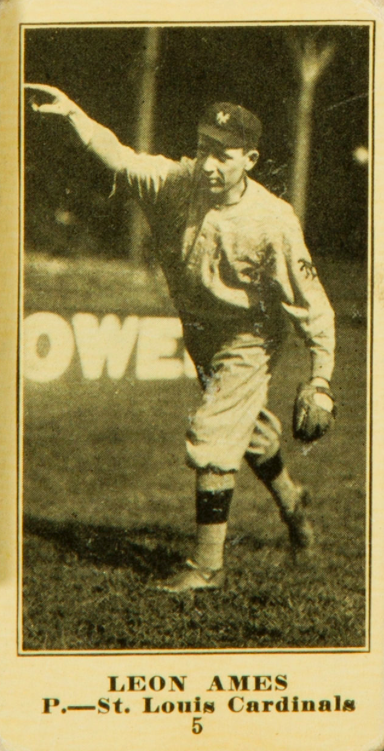 Oh, my priorities before baseball cards! Hi Matt! Great blog. Good luck with your #5 collection, I think that's a great way to do a type collection!